Metro has commissioned a study to explore the potential to roll out an on-demand transit pilot in locations throughout LA County. This is an opportunity to reimagine mobility on a small-scale, and we want you to help us design your ideal service for your community. 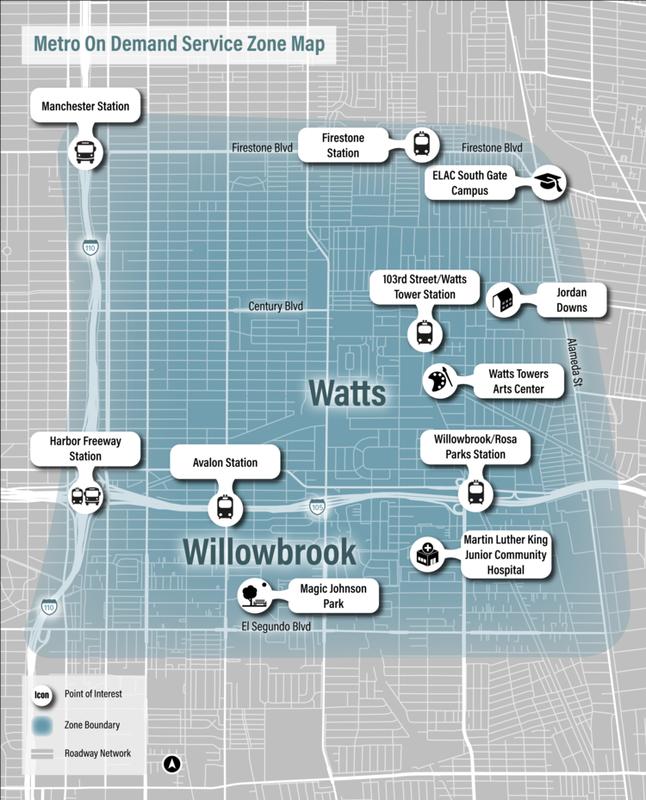 Check out https://www.gometroondemand.com/ to learn more about the zones we’re looking at and take our survey (the zone closest to us is the greater Watts area, encompassing two of our Green Line stations and the Manchester freeway Silverline station–see map below). A Personal Touch: In addition to using an app to book a ride, riders also have the option to use a call center to schedule a ride – either on-demand or in advance. Short Distance: The service will be available in identified service zones, and will provide access for short trips – around 20 minutes or less. Accessible: While vehicles will be smaller than traditional Metro buses, all vehicles will provide access for wheelchairs and other disabled riders. TAP-Friendly: Customers will be able to link their Transit Access Pass (TAP) card, which can be used across all other transit service in LA County, to pay for the service. Help us design your ideal mobility future by learning more about our zones and sharing your input through our survey. If you have any questions or would like to learn more, please contact Laura Muna-Landa at 909-627-2974, or LMuna-Landa@ArellanoAssociates.com.